There are many plants which will grow successfully in soils which are permanently moist, but few will survive long spells of flooding or waterlogged conditions, especially in summer. The ones listed here are more tolerant than most. Liquidamber has impressive autumn colour. Air and water are needed for plant roots to support healthy growth. Saturated soils will have insufficient oxygen for healthy root function and may lead to root decay. Fortunately, there are some shrubs and herbaceous perennials which don’t seem to mind having wet feet. For mixed extremes, see our list of plants tolerant of both wet and dry soils. Before planting trees in wet conditions, you may need to improve drainage. On soils prone to wet conditions in winter and drought in summer, such as heavy clays, improve the soil by incorporating bulky organic matter. This should be done over as large an area as possible. Artificial drainage will be necessary if severe waterlogging or flooding is a problem. 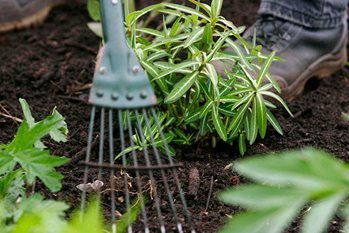 Improve drainage at the base of the planting hole by forking through any compacted soil. Fork through the sides of the planting hole or break down the sides into the planting hole when backfilling. This avoids creating a planting 'bucket' or sump which fills with water: a problem that can lead to poor establishment or the death of the tree. On heavy soils prone to winter wet, protect the finer surface feeding roots by planting trees on a slightly raised mound to improve drainage around the root system and carry out the planting in early spring. Where only a genus is mentioned, such as Spiraea, all species can be considered. Cultivars of the species listed, such as Hydrangea macrophylla ‘Altona’ are also suitable.